Spoke & Leaf Farm is a veganic farm outside of Portland, OR. It was founded in 2015 by Bonnie Hildebrand. The following profile is based on a conversation between Mona Seymour and Bonnie Hildebrand. What was your path to becoming a farmer? I container-gardened for many years when I lived in apartments, and later I had a small backyard with a garden plot. In 2011, I found out about a program called the Beginning Urban Farmer Apprenticeship Program from another student I met at a permaculture retreat. It’s an eight-month intensive organic urban horticulture program. I was really interested, and it ended up that life circumstances came together and I was able to apply for the program and was accepted. I attended in 2012. It was two days per week, one night per month, and one Saturday per month, so I did that while I still worked full time. The next year, I interned with the program. Following that, I worked for another farmer for a season. Then I had the opportunity to start my own farm in 2015, because my father had purchased some land. How did you learn about veganic farming? I’ve been vegan for 21 years, so when I was going through the urban farming program, I already knew there was no way I was going to use animal products to grow food for myself, and I hadn’t used them when I was container gardening, so I think the concept already existed for me though I didn’t have a word for it. I learned that there was actually a term for it and that there were a couple of organizations around veganics, through Northwest VEG, which is a local outreach organization that I’ve worked for. Some of the people involved there are long-term vegans and veganic home gardeners, so I learned a lot from them. Why do you farm veganically? The vegan part of it is very important to me – obviously I can’t ethically get on board with using any animal products to grow food. And the organic side of it definitely comes from my interest in doing as little harm as possible in the process of growing food. I don’t use any chemicals at all. I don’t even use organic-approved chemicals on my farm. Which is a little challenging: for instance, I don’t have a real good balance between what we’d call “bad” and “good” insects – the ones that want to eat the plants that I don’t want them to eat, and the ones that control the populations of what we call the “bad” insects. I’m hoping to achieve that balance through planting beneficial plants that attract those predatory insects – beneficial hedgerows, shrubs, and bushes – and also through good plant management and good plant hygiene. 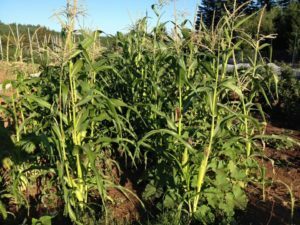 I don’t know if that is going to change or not as my farm business grows: as my acreage grows, as my production grows, I may find that I feel the need to use some organic-approved chemicals. But that’s definitely not in my plan at this point. What are some other challenges that you have faced as a farmer? Financial challenges are definitely a thing. I didn’t have loads of money to start a farm with. I started with what little I’ve had and have scraped as much as possible. I work off the farm full time or even more than full time from October to April, and then during the growing season I work off-farm a little bit in order to support myself and support the farm. I started a CSA this year partly because it gives me, as a farmer, an income in the winter, in order to have the financial resources to grow for the next season. Knowledge is another factor. I’m new to this. I don’t have 15 years of experience under my belt – I don’t have that knowledge base. And I couldn’t learn everything in eight months of education. It’s hard for me to interact with other farmers who aren’t veganic because they tend not to be particularly helpful when they find out I don’t want to use animals or animal products. Being a female farmer gets challenging too. I do a market stand and a CSA, and at the market it’s not unheard of for me to be asked where my husband is, as if I need a man to run the farm. It’s hard when I go buy equipment, because I’m almost always interacting with men, and generally older white men. Even though I’m a relatively new farmer that doesn’t mean I don’t know anything, but it’s not uncommon for me to get the attitude that I don’t know what I’m talking about. So I tend to be a little guarded. But I have the benefit of knowing and being friends with other female farmers, and I know other female veganic farmers; that is very helpful to me. I was casting about for a name for the farm and came up with a few. Spoke and Leaf is the one that won out in a small workshop of three friends who helped me choose. The leaf represents plants and growth, and the spoke represents the many components that support the constant circle of change that is a farm, as well as that I’ve been an avid cyclist. I’ve had the farm since 2015, for two seasons. The property is 43 acres but I only grow on one-half of an acre, with the hope to add a couple acres of orchard. Most of the land is very steep, very hilly, so growing vegetables is pretty limited to between half an acre and an acre. So orchard is really where it’s at for me. I grow a large variety of vegetables. [Mona: Any favorites?] I love vegetables. I always look forward to really good tomatoes. I know everybody says that, but there’s just something really special about really fresh tomatoes, standing there in the field and eating them. I love my greens; I grow, I think, eight different varieties of kale. I know it sounds so stereotypically vegan, but…! Weird winter squashes are always fun to grow. This year, I grew Jamaican burr gherkins. They’re a kind of cucumber, but you usually cook them. They’re a little, spiny, round cucumber, and they’re delicious. Burr gherkins are, in this area, a newish vegetable for people. If you want to talk about challenges, that’s one of the things that’s challenging – to be on the forefront of introducing new vegetables, because you can demand a higher price for them, because people are like “Oh what’s that, that’s unusual” and once they like it they want more of it. It’s what gets chefs interested. But you don’t want to overproduce it because you can’t sell that much of it. I sell through a farmers market and a CSA. Food Fight Vegan Grocery [a local grocery store] buys from me, and I’m really hoping to take on restaurant clients next year. There are so many vegan restaurants in the Portland area that I’m hoping some of them will become customers. Tell us about the goats on your holding. Are they involved in your farming in any way? I love goats. I think they are absolutely amazing, wonderful beings. I adopted two from a sanctuary called Out to Pasture, and four from another sanctuary called Harmony New Beginnings. They’re rescues, and they’re just here, living their lives. Anyone who has the opportunity to rescue a goat – not just one, two, because they need each other – it’s the best thing ever. They’re amazingly sensitive beings. They’re so sensitive to how you interact with them, and your moods. They can be pretty moody themselves! In October I rescued five roosters, so there are roosters here now too. 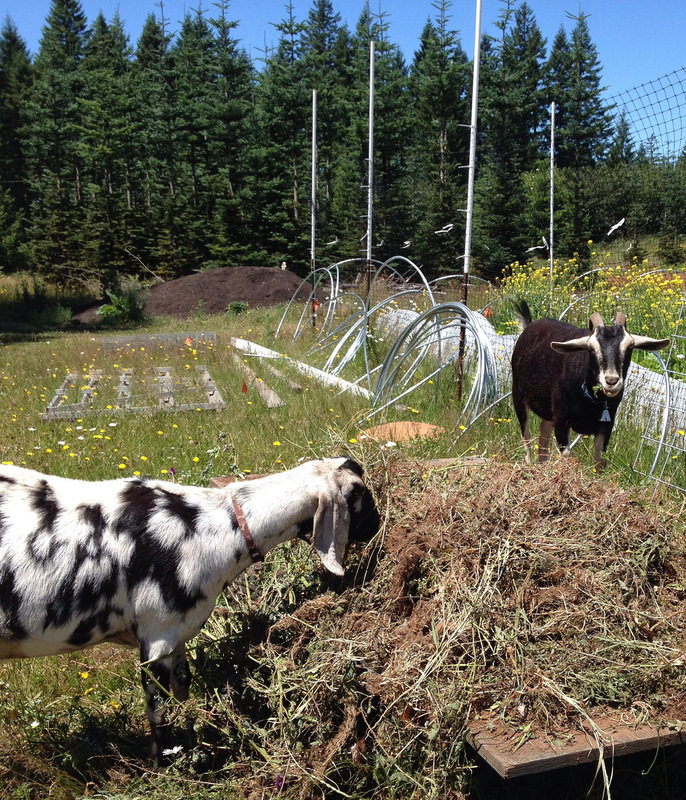 [The goats at Spoke and Leaf Farm are not used to contribute to soil fertility in the growing area. 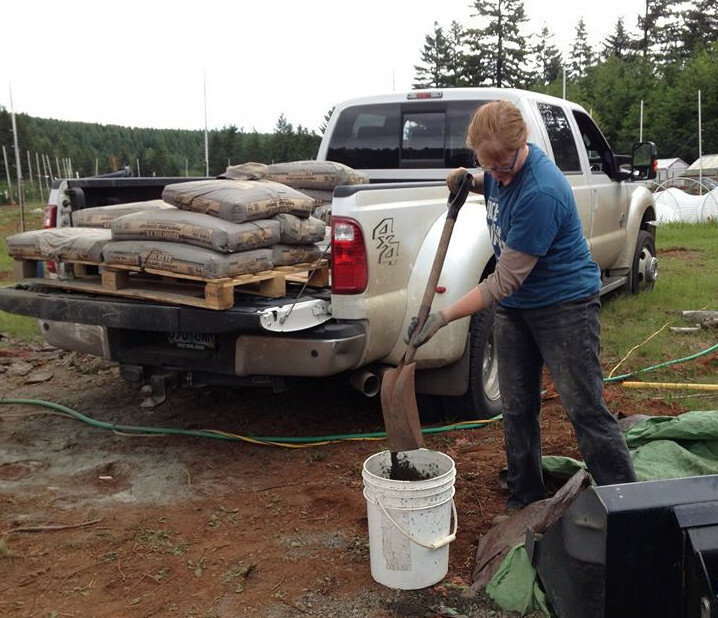 Bonnie uses barriers to attempt to exclude them from this part of the farm.] My field is completely fenced with deer fencing because of the goats and because of the deer. Otherwise I wouldn’t have any crops. Although, my goat Violet is very smart and she’s extremely good at defeating the fence. She likes to do what she can to get in there to eat, and she invites her friends in when that happens. Last year they finished the season early for me as they devoured all of my celery and kale and collards. I tried to let them know that they’d eaten their entire allowance of hay for the year, but that didn’t matter to them! 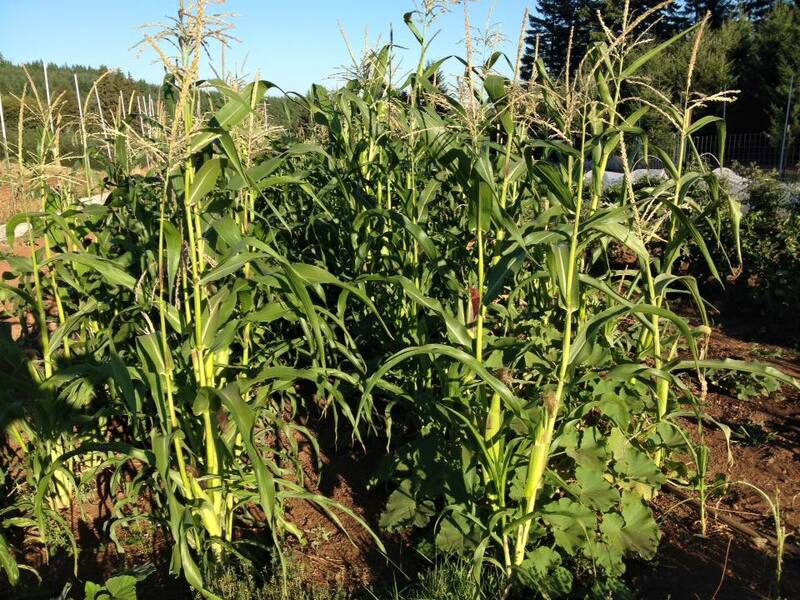 Do you think Oregon has a lot of potential to expand its veganic farming offerings? Definitely. Oregon has a lot of great programs and financial incentives for new farmers. There is a lot of education and a lot of outreach to educate new farmers. There’s an organization called Friends of Family Farmers and they have wonderful online networking for farmers who are looking for farmland to rent or purchase, called Oregon Farm Link. That’s one of the biggest challenges of farming regardless of your style of farming – finding good quality land to farm on that you can afford, be it to rent or purchase. There are also great farmer training programs. There’s the one I went through, the Beginning Urban Farmer Apprenticeship Program, and there’s the Rogue Farm Corps which is more in-depth. Oregon State University (OSU) Extension has wonderful education. What needs to happen to build the veganic farming movement? The biggest challenge is getting the educational institutions on board with it. They’re still stuck in the idea that you have to use animal products to grow food successfully. I get the sense that even someone like Helen Atthowe [a long-time veganic farmer who has done research on veganics through OSU], with all of her amazing experience and years and years of knowledge, she still has a hard time getting people on board with the idea that animal products are not necessary for growing. What holds people back from believing that you can farm without animal products? We have a whole mythology around using animals in agriculture, for land clearing, fertilizer, labor, et cetera. It’s true to an extent, of course, but we ascribe greater importance to their use than is realistic. Yes, animals over thousands of years added fertility to the ground, but today’s agriculture is trying to do that over a very few years while still allowing massive soil erosion through run-off and concentrated animal grazing, which increases the needs for fertilizers, which creates the idea that we need to use more animals for fertilizing. The cycle continues without thought to the damage. We see the waste from animals as a “free” source of fertility, yet discount the damage to the environment in creating that “free” source. What would you say is the strongest argument for expanding veganic agriculture? The environment. As much as I’d love to say it’s the animals, it’s really our environment. By using animal waste products to grow more food, we are just contributing to the problem – supporting animal agriculture, which is the biggest cause of all of the climate change. If we don’t create a demand for those waste products, we limit how much the industry can produce. Is there anything you’d like to add about your farm, veganic farming, or farming in general? I would hope that people can recognize that it’s so important to support farmers through buying from them as directly as you can. You may not be able to go to a farmer’s market or purchase a CSA share; maybe you have to shop at a local store that buys directly. I think the biggest thing is to understand that cheap food is a big problem in this country. If you think you “have” to eat for a dollar a day but you can afford more than that, you need to pay more than that, because you’re really hurting the farmers by supporting super cheap food. You’re hurting the farm laborers. And you’re hurting the animals, because you have to use animals to produce extremely cheap food. Government subsidies make animal-based foods cheap and make using animal-based products as fertilizer cheap, rather than promoting better nutrient management and soil health improvement through other means. For more information on Spoke and Leaf Farm, see this beautiful video by vegan videographer Nick Brown of Quick Hit Record. Photo Credits: Photo 1, 3 and 4 taken by Bonnie Hildebrand. Photo 2 taken by Lyndsey Clark.